Any insurance policy or health services contract by which groups of employees (and often their dependents) are covered under a single policy or contract, issued by their employer or other group entity. What are the most common types of health insurance plans? 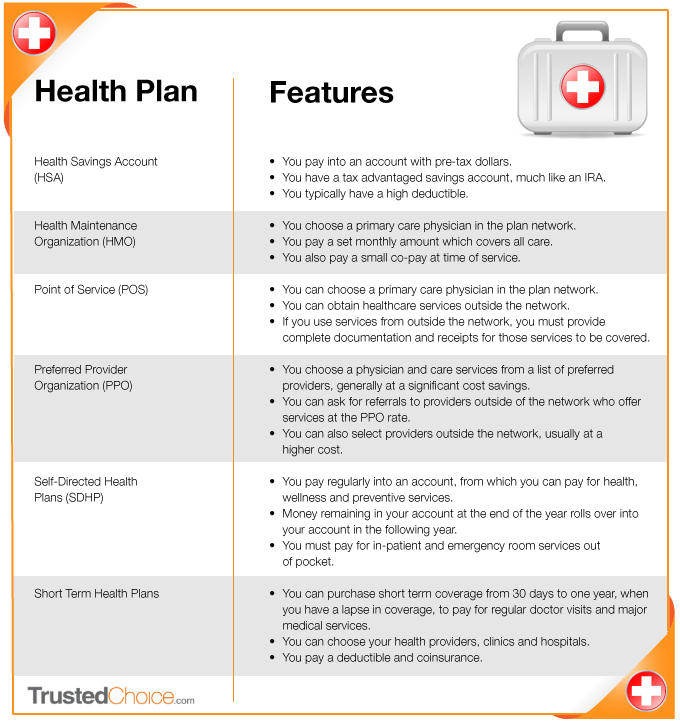 See the chart below showing popular health plans and their features, from Trusted Choice. What is the best way to explain deductibles, coinsurance and out-of-pocket limits? A deductible is an amount you must pay each calendar year before your plan begins to pay for a particular medical service. Coinsurance is a percentage of the medical cost you are responsible to pay, once you satisfy your deductible. For example, if you have a $1,500 deductible, your company may have an 80/20 coinsurance plan, whereas you are responsible to pay 20% of the medical cost after you reach your deductible and until you reach your out-of-pocket limit. Deductible plus coinsurance equals out-of-pocket limit, a form of financial protection for you and your family. Most coverage types require members to share costs through deductible and coinsurance for some or all services. To protect you and your family during serious illness or other lengthy treatment, this approach limits your potential share of deductible and coinsurance. After you’ve met your out-of-pocket limit, your benefits will be paid at 100% of the allowed price for the rest of that calendar year (excluding separate copayments associated with office visits, hospital visits and prescription drugs). What rights do I have if I lose access to my employer group health insurance coverage? Millions of people who lose their group health insurance coverage due to a job change, divorce, job loss or other reasons are able to keep their group coverage, at least temporarily. Most people who are able to continue their group health insurance benefits are eligible to do so according to the federal Consolidated Omnibus Budget Reconciliation Act of 1985 (COBRA). However, COBRA does not apply to all employers, and many states have mandated other continuation-of-coverage options for people who are not covered by COBRA. In some states, continuation coverage mandated by the state may be more generous than COBRA. The benefit summary booklet provided by the employer may provide details about continuation coverage or who to contact for additional information. Also, many people leaving group insurance will have the option to enroll in individual coverage. Depending on the individual’s circumstances, they may be able to qualify for a special enrollment period to enter the individual insurance exchange (Marketplace) and apply for a federal subsidy. However, once a person enrolls in COBRA or state continuation, their options to purchase individual coverage are more limited. Once COBRA coverage has begun, a person can only enroll in individual coverage during the individual annual open enrollment period or at the end of their COBRA coverage. Can providing group dental insurance potentially save us money on group medical insurance? Yes. When employees are taking advantage of preventive services by their dentist, they reduce their risk of developing problems that contribute to their overall health. Poor dental health can lead to gum disease. Studies have shown gum disease to be a risk factor for coronary heart disease. Good dental health has also been linked to the reduced risk of diabetes and diabetic complications. By offering dental insurance, employees are more likely to take an interest in their oral hygiene and reduce their risk for further, much more serious health-related issues over time. What is a typical benefit summary for dental insurance? Services typically covered at 100% are preventive (e.g. cleanings, fluoride, space maintainers and sealants for children) and diagnostic services (e.g. evaluations, x-rays). Services typically covered at 80% are restorative/basic services (e.g. fillings, extractions, root canal therapy, periodontal treatment, emergency treatment). A waiting period may apply before an employee is eligible. Services typically covered at 50% include major dental work (e.g. removable and fixed partial dentures [bridges], crowns and onlays). A waiting period may apply before an employee is eligible. Orthodontic services are generally covered at 50%. A waiting period may apply before an employee is eligible. How long can an employee collect short-term disability? Short-term disability helps employees replace a portion of their income if they become disabled, due to a non-work related accident or injury, generally from three to six months. After what period of time is the disability considered long-term? Long-term disability (LTD) coverage usually begins where the short-term insurance policy leaves off. LTD benefits begin at the end of the benefit waiting period, typically 90 or 180 days. LTD benefits end automatically on the date the employee: 1) ceases to be disabled; 2) fails to provide proof of continuing disability; 3) becomes eligible for benefits under another group LTD plan or; 4) reaches the end of the maximum benefit period for which LTD benefits are payable for any one period of continuous disability, whether from one or more causes. What exclusions typically apply to long-term disability coverage? Some of our employees have personal life insurance policies. Is there value to offering a group life insurance policy? More and more businesses today are offering life insurance policies as an essential part of their employee benefit package. Together with other forms of insurance and benefits, it’s a great tool to attract qualified employees and ensure financial support for their family, should something happen to them. Another benefit to group life insurance is that it is guarantee issued up to a certain amount, and employees can sometimes “take” their coverage with them, if they leave their current employer. How much life insurance is typically offered to an employee? This varies as a matter of employer choice. Many employers provide a benefit that is a flat amount or one that is a multiple of employee salary.